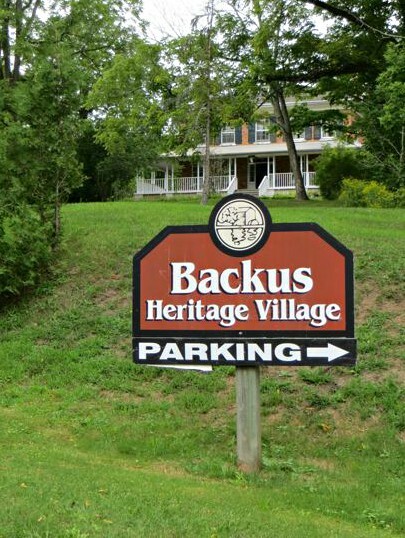 I had never heard of Backus Heritage Village until a friend suggested we drive down to partake of the Bluegrass Festival that was being held there this past weekend. 150 musicians from Ontario, and places such as Michigan, New York, West Virginia and Wisconsin would be performing at various locations. No stages, just informal gatherings for an old-fashioned jamboree. 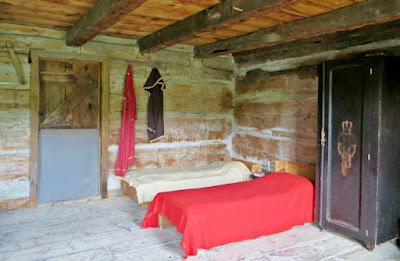 Not sure what it was like on the Saturday, but when we arrived before noon on Sunday it was strangely quiet. Very few cars and certainly no music. It was advertised as a two-day event, but nobody was playing anything on Day Two. There were several trailers around and people were sitting and resting, or packing up. Disappointed, we decided to make the most of the visit and wandered around. 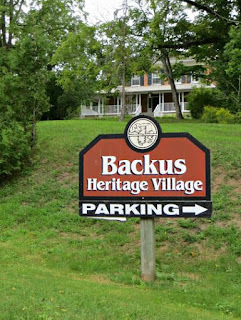 Backus Heritage Village is part of Long Point Conservation on Lake Erie and is now a National Historic Site. The 1852 homestead of John Backus is one of about 15 buildings that comprise the village. 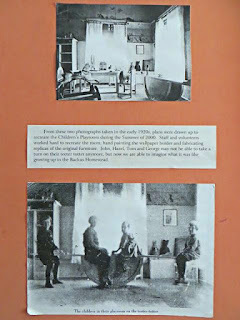 Inside you can find interesting things like this indoor teeter-totter with a photo of the family enjoying the fun - though the seats in the photo seem to be longer than the one exhibited which would allow for better and safer teetering, I think. 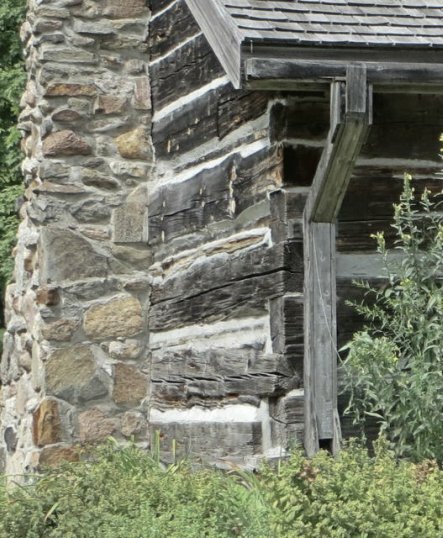 and the wood eaves and downspout! 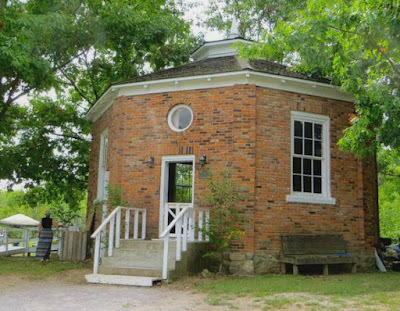 The Cherry Valley octagonal schoolhouse was perhaps the most unusual building. 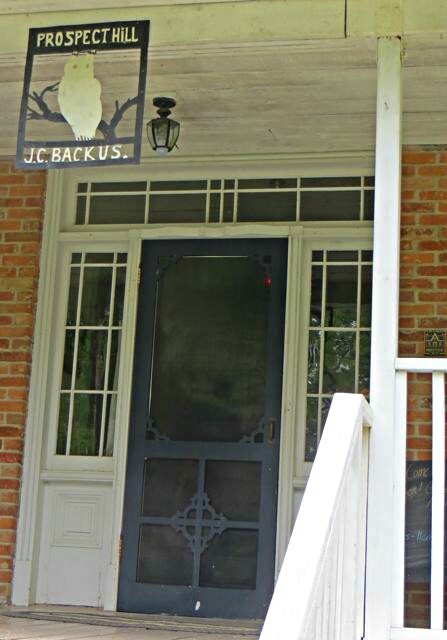 Built in 1866, each side measures 36 feet and the outside walls were constructed of three layers of brick. 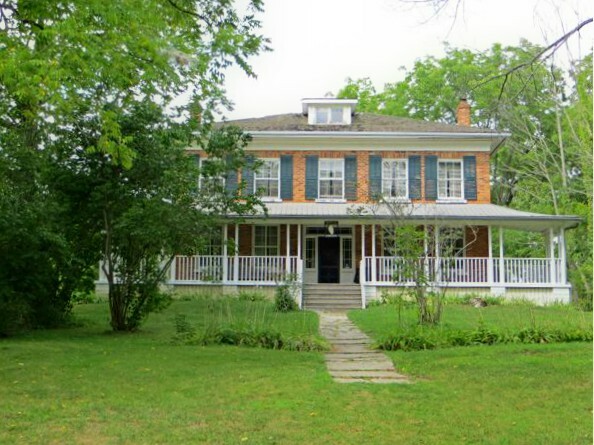 It is only one of two octagonal schools in Ontario and was in use until 1929. 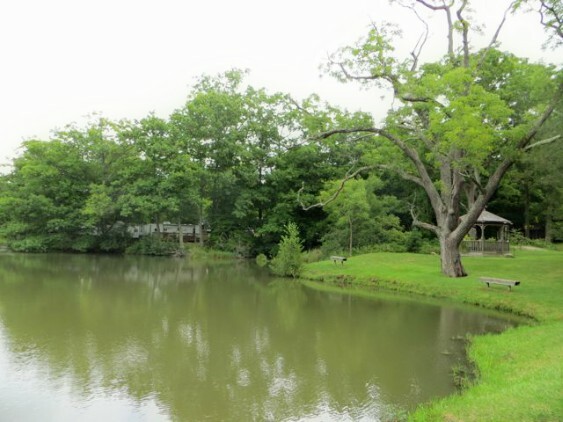 It was relocated to this spot in 1982. 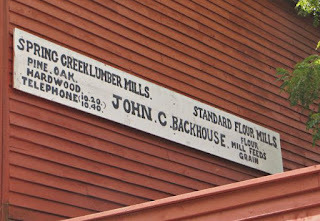 The pièce de résistance, though, was the Mill. 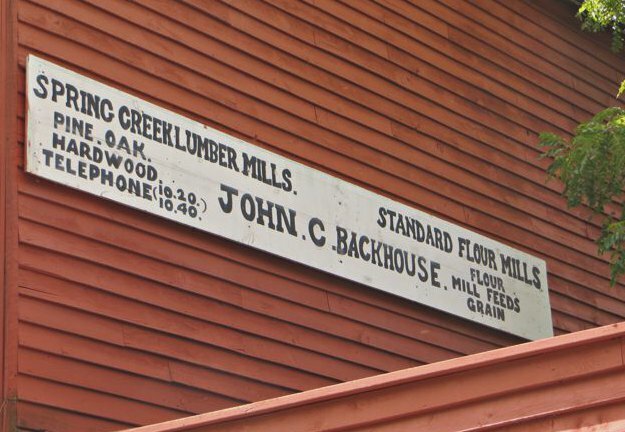 When John Backhouse (no idea when his name changed spelling to Backus) arrived in 1796, he acquired 600 acres at this site on the condition that he build a grist mill as one was sorely needed in the area. First order of business was a saw mill and used the lumber to build this grist mill. 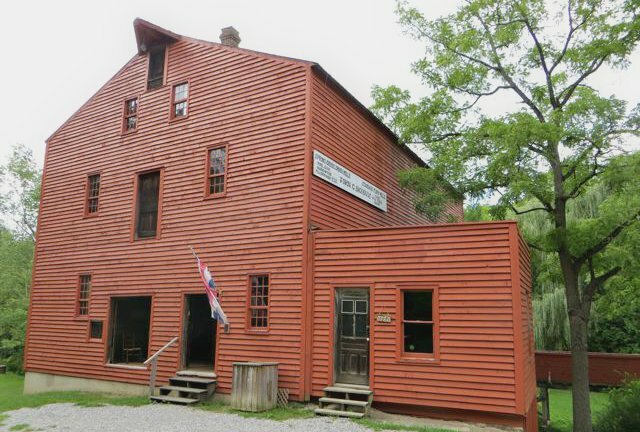 It is one of the oldest and best preserved water-powered mills. 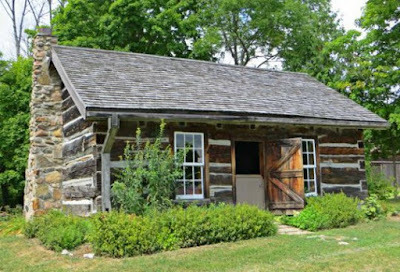 The entirely wooden structure has survived through two centuries of continued use - even making it unscathed through the War of 1812, probably due to Major Backhouse's influence. 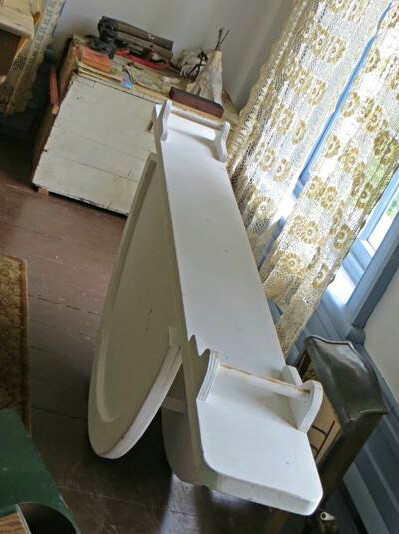 It was in use until 1955, and is now used for demonstrations. By now my camera battery was prematurely dying, so mostly I just gaped open jawed at the interior as the excellent interpreter explained the inner workings. It was a jungle of wood spouts and chutes. As newer innovative methods were introduced, they were simply added to the older spouts. None of this tearing down and replacing that is done with abandon today. Bummer! How about linking this treasure to Tuesday's treasures? This looks like more fun than listening to a bunch of folks fiddling around. well, the fiddlers would have added some life to the surroundings, for sure. The idiosyncracies of language! A teeter-totter is a see-saw where I come from, but your word is more descriptive. :) Shame about the music but it does look an interesting place for a mosey round. Thanks for the link up, Violet. and the idiosyncracies of of Canadian speak - we also use the word see-saw, and I couldn't remember which one was American and which was British! it does sound like fun and what a great setting! love all these old buildings! It was a lovely setting - very open and spread out on gently rolling hills. Thanks for this, I just pinned it for one of our drives. This place is only open til Labour Day - so hurry! Too bad about missing the Blue Grass music. That is odd as Blue Grass musicians just love to play their music with each other if they are still there. 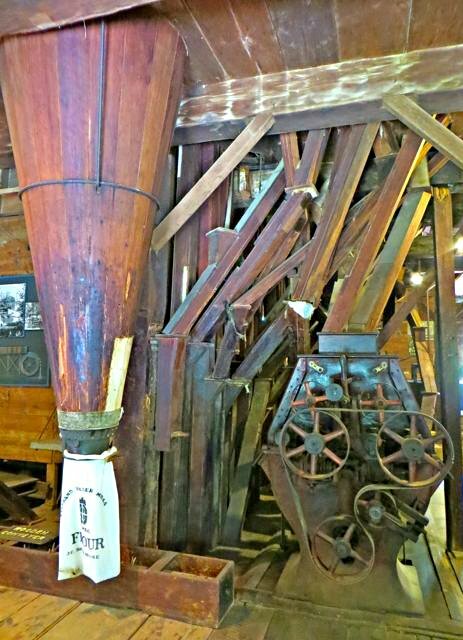 Your photo of the mill is excellent. I was expecting endless jam sessions. Oh well. What a delightful place. 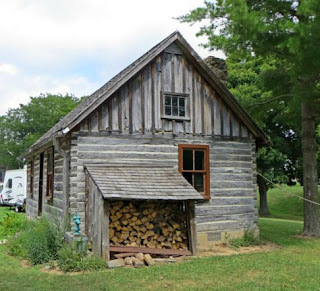 While in southeastern Ohio last week I saw a lot log building, many in need of work. Thanks for sharing your treasure, I hope to see you around again. I suppose some log cabins were made to last forever, and some only until something better could be built. I love places like this! I think my favorite part is that octagonal schoolhouse.